Carved into the chalk of a hillside in southern England, the Uffington White Horse is unique. Stretching 360 feet from head to tail, it is the only prehistoric geoglyph – a large-scale design created using elements of the natural landscape – known in Europe. “There’s just nothing like it,” says University of Southampton archaeologist Joshua Pollard, who points to the Nazca lines in Peru as the closest parallel. Pollard says that because the site is so anomalous, researchers have resisted grappling with its distinct nature. As a consequence, few new interpretations of the site have been advanced since the early 20th century. 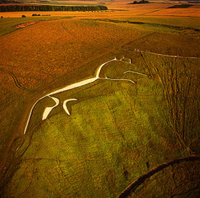 “Archaeologists are tripped up by things that are unique,” adds Pollard, “and the White Horse has thrown us.” But now, after making a close study of the site and its relationship to the landscape around it, Pollard has developed a theory that connects the Uffington Horse with an ancient mythological tradition. Stories about the White Horse have been recorded since medieval times. One popular legend was that it was carved in celebration of an Anglo-Saxon victory over a Viking army in AD 875. However, excavations in the 1990s yielded dates that showed it was created much earlier, during the Late Bronze Age or the Iron Age, sometime between 1380 and 550 BC. Most archaeologists have believed the site was probably a symbol that signaled a prehistoric group’s ownership of the land – their attempt at creating a landmark that was meant to impress outsiders. But Pollard did not find this idea wholly persuasive. “It doesn’t really work that way,” he explains. “For one, the way it’s positioned makes it difficult to see the whole geoglyph from the surrounding landscape.” Pollard found there are other hillside locations in the immediate vicinity that are much more visible and where creating a totemic image meant to symbolize a group’s identity would have made more sense. Pollard usually works on sites dating to the Neolithic, a period when people erected large monuments, such as Stonehenge, that were often aligned with astronomical events. This experience led him to wonder if the Uffington Horse could have been designed along similar lines and he investigated how the geoglyph was positioned relative to celestial bodies. He found that when observed from a hill opposite, in midwinter, the sun rises behind the horse and as the day progresses, seems to gain on the horse and finally pass it. From the same vantage point, at all times of the year, the horse appears to be galloping along the ridge in a westerly direction, toward the sunset. Over time, though its original purpose was lost, local people maintained a connection with the White Horse that ensured its continued existence. “If it weren’t maintained, the White Horse would be overgrown and disappear in 20 years,” advises Andrew Foley, a ranger with the National Trust, which oversees the site. Historical records indicate the local community has long held regular festivals devoted to maintaining the site. In 1854, some 30,000 people attended. Now, each summer, a few hundred local volunteers weed the White Horse and then crush fresh chalk on top of it so that it maintains the same brilliant white appearance it has had for 3,000 years. The site, as it must have throughout millennia, is still meaningful to the people around it. Source: Eric A. Powell, Archaeology Magazine, August 14, 2017.